This superb little shed has plenty of standout features. It belongs to the incredibly popular Treetops Traditional collection, though unlike most models it benefits from an apex roof. This means it is one of the tallest buildings in the range. 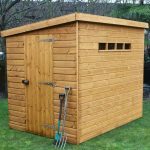 For a full list of more 6×4 sheds why not check out the What Shed 6×4 shed winners. It benefits from superior quality Deal Redwood Shiplap tongue and groove cladding. Its interior is also fully created from tongue and groove. This makes it durable from the inside out. The door is fully hinged, has a thick construction and measures taller than the doors found on even 10×6 buildings. So you can literally just walk right in with your tall tools and equipment without needing to duck. A key operated lock is built into the door for maximum security too. One thing this range is particularly known for is the unique customisation options provided. With others in the range, you can alter the door. With this shed it is the windows you have the most control over. Two fixed windows are provided, but you can choose to change them into openable windows. Or if privacy and security are your main concerns, you can choose a windowless version instead. A different style door is also available. The stable style door adds a more unusual design, though you will need to request this from the manufacturer. Low quality roofing felt included. Though this is the same felt supplied with most sheds, for the price it would have been good to see a better quality used on this model. This standard apex shed is actually anything but standard in comparison to the same size competitor sheds. It is offered in the very popular Treetops Traditional range and boasts some brilliant features. 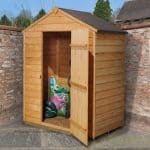 Unlike most sheds in this range, this one comes with an apex roof which means it has a much taller height. It is also designed as a standalone shed and shouldn’t be assembled next to another building. Approximately 300mm or a foot, should be left around the shed to allow adequate air flow to circulate. The door is also wider than the average building, giving you plentiful access and making the storage of bulky tools and equipment simpler. The height of the door is also worth mentioning. At 5’9” it is much taller than the doors featured on even the largest sheds. All of the sheds in this range come with a tongue and groove floor and roof. You can see even from the outside that the roof has a thicker than average construction. The fact that it is covered by a thin felt is a little disappointing, but it will protect against heavy rain and harsh winds for around a year before it needs to be replaced. As it comes with a tall apex design, you are free to store items such as fishing poles, rakes, brushes and shovels. The main benefit of the interior tongue and groove is the fact the floor is suitable for heavyweight equipment and tools. You won’t need to worry about its stability and there’s less chance of it getting damaged over time. The signature feature of Treetops Traditional sheds is the high quality Deal Redwood timber used for the Shiplap tongue and groove walls. It offers an individual look that isn’t found on many other sheds. When you buy a Shiplap clad shed, you can be sure it is built to last. It is one of the most weather resistant materials and it also has the added benefit of being attractive too. It comes with a smooth design, unlike the rough-sawn overlap clad buildings. This isn’t just more aesthetically pleasing, it also means you won’t have to worry about getting splinters if you touch it. A thick 44mm x 27mm frame supports the shed and it also comes with rounded edges. This is mainly used because it acts as a good barrier against moisture. A premium quality dip treatment is used on the timber at the factory. Therefore immediate treatment after installation isn’t necessary. 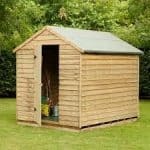 Shed Store do recommend treating it within 6 weeks however and continuing to treat it each year to top up its weather protective barrier. Even the door of this impressive little shed is constructed to a superior quality. With three, rather than two hinges, it is solid and sturdy so that it will never sag no matter how much it is used. One of the key things that sets the Treetops Traditional sheds apart is the fact that the door is customisable. With this model you can request a different stable style door. It is still a single door, but it has a very unique attractive design. 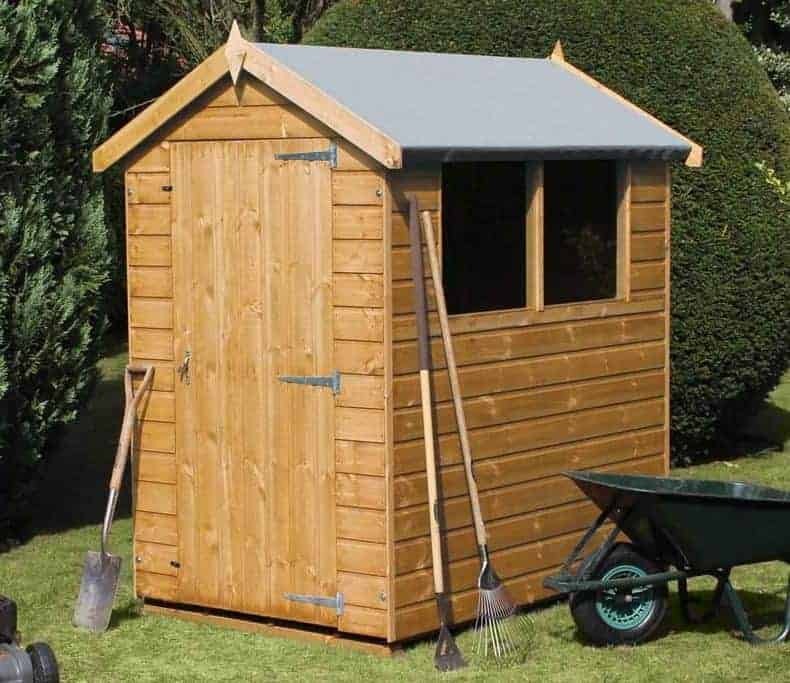 You cannot request this on the Shed Store site so you will need to contact the manufacturer if you would prefer the stable door design. One thing you can change on the site however is the windows. As shown on the picture, two large, square windows are included on the building. As standard they come with a fixed design. However, for a little extra money you can change one or both of them into opening windows. Or at no additional cost you can choose a windowless model instead. The windows feature horticultural glass which you will need to fit yourself. You can also choose to fit them on either side of the building. One thing Treetops Traditional sheds do well is security. Compared to competitor sheds the security on this one is hard to beat. It comes with a very secure, high quality key operated lock. This isn’t going to be easy for anybody to break into. You can also control the level of privacy on the shed. If it is going to be used to store valuable equipment and tools, we’d recommend choosing the windowless version. If you’d really rather have the windows but you’re still worried about privacy, you could add curtains. 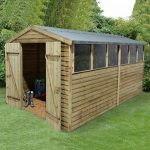 One of the main things we like about this Traditional standard apex shed is that it comes with a unique range of customisation options. The windows are the main feature you can alter. The two windows supplied with the shed have a fixed design, but if you’d prefer you can choose to have opening windows fitted. You can also choose whether you want both windows to open, or just one of them. Each opening window you opt for will cost extra. For no extra cost you can also choose to have a windowless design. This is advisable if you’re hoping to store valuable tools in the shed. Floor bearers are another customisable extra and we feel these are definitely worth considering. The ones provided are designed specifically for the 6×4 model and they help to ventilate the floor, protecting it from rot and in turn increasing the building’s longevity. Your last option is to invest in the garden building installation service. This will take away any stress that comes with building the shed, but as it is such a compact model, the assembly isn’t actually that hard. It also doesn’t take too long so this isn’t going to save you too much trouble and you might be better off saving the money. All of the sheds in the Treetops Traditional range benefit from an extremely high quality design. There’s nothing to dislike about the quality of this shed. The only thing that could have improved the longevity of this building is a pressure treatment. This eliminates the need for annual treatments. 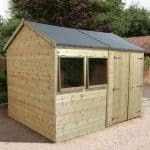 However, the dip treatment applied at the factory does improve the longevity of this shed and the fact only the highest quality materials have been used throughout its entire design ensures you receive a very strong, long lasting shed. 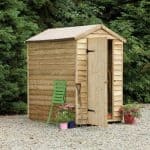 This shed is primarily aimed at those seeking a small storage space. It’s ideal for small gardens which don’t have the luxury of a lot of space. The fact you can add shelves if you need to further boost the storage space on offer so overall it will suit most people’s storage needs. Customers who have bought and installed this shed have said it is very easy to put together. This isn’t surprising really considering its small size and simplistic features. Though a little more expensive than other similar size sheds, you really do get what you pay for here. The security is fantastic, it has a long lasting build and only the highest quality materials have been used. We also like the customisation options available. All in all it’s a fantastic shed which offers extremely good value for money. Final Thoughts: This is one of the most unique little sheds we have reviewed. There’s so much to love about the design of this building. We especially love the choice of windows available. Fixed or openable, or even a windowless design can be selected. This allows you to choose the level of security and privacy included on the building. There’s also a choice of door, though the manufacturer will need to be contacted for this customisation choice. The height of the shed and thorough tongue and groove construction make it an incredible model. All in all there’s not much to dislike about this shed and we highly recommend it.